Newcastle United have renamed their ground the sportsdirect.com @ St James' Park Stadium for the immediate future. The Championship club said last week it was looking to sell the naming rights to St James' Park from next season. But it has now decided to use the ground to showcase the retail company controlled by club owner Mike Ashley until the end of the current campaign. "We will showcase Sports Direct until the end of the season," chief executive Derek Llambias told BBC Newcastle. welovemikeashley@stjames'park has a better ring to it! 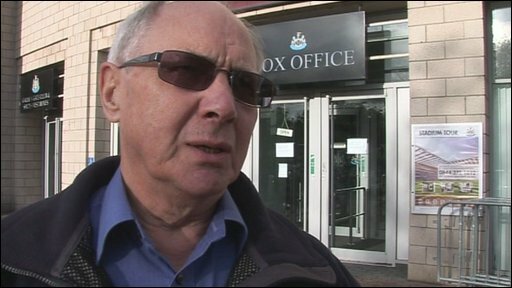 Former Newcastle chairman Freddy Shepherd criticised the move to re-name the stadium, telling BBC Sport that "there are some things that money can't buy". Ashley angered supporters of Newcastle when he announced the club's plans to rename the stadium for commercial purposes. The announcement came on the same day as he took the club off the market after failing to attract a buyer willing to pay the reduced asking price of £80m. He had bought the Magpies for £134m two years ago while it was still in the Premier League. Asked if the name "St James' Park" would always remain amid an angry response from fans, Llambias said: "Absolutely. In our reign, absolutely. "It's adding to it, and if it brings in a good chunk of money to the club, that goes straight to the team, then do you know what, it's a revenue we should look at." Speculation had linked adidas, who are already Newcastle's kit suppliers, with the naming rights for St James' Park. But the company released a statement announcing they had not been offered the naming rights to the stadium and would not wish to take the rights if they were offered. The controversy over renaming the stadium is the latest to engulf the current regime, but Llambias is convinced people will not mind if the team is successful on the pitch. He said: "Success, really, will heal the wounds, and time, a combination of both. We are patient people and I think the fans will come around eventually. "I have no idea what length of time that will be - I may be a very old man before it's done - but I think the fans will see in the future that we do care."